Despite iTunes’ ubiquity, I continue to find it so fascinating. Oft times, it’s the synchronistic oracular moments. Other times – like today – it’s the myriad different ways it allows one to parse data. When Warren Zevon’s classic polka “Mr. Bad Example” began playing I looked up and realized just how many songs there were about men. And then, how very few there are about women. And this struck me as odd. Aren’t men always writing songs about women? Maybe. But they surely aren’t writing them about “Mrs”. And even they are, “Mrs. Brown” is really a song about her Lovely Daughter. And “Mrs. Leroy Brown” is an obvious counterpoint. It’s awfully Brown too, isn’t it. But maybe, I thought, that since “Mr.” applies to men married or single, maybe if I added “Miss” to the list it would come closer to evening out. Not so much. It may be that there are more “Sweet Carolines” than “Handsome Johnnys”, but when it comes to respect and honor, woman seem to be getting the short end of the stick. 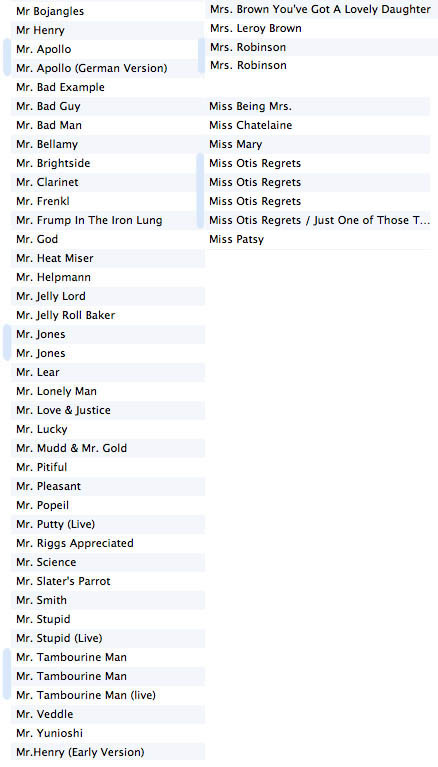 I take some small satisfaction in seeing that Miss Otis outnumbers all other Misters and Misses though…. Sometimes I find myself startled by surprisingly unthreatening things. Like the addresses in Logan, Utah. It seems that the Mormons decided that building giant fortress temples and Sci-Fi outposts on promontories was not really sufficient. They also needed to give their street names… numbers, specifically numbers showing that street’s coordinates from the central temple. I appreciate a proper grid system, and thorough organization. I really do. But somehow this street-naming convention took me back to Madeleine L’Engle’s A Wrinkle in Time. I had a momentary shudder at the thought of ending up like a possessed Charles Wallace. I suspect that the omnipresent of “I’m A Mormon!” billboards were a factor as well…. After the initial shock wore off, I thought about the importance of street names to memory, for talking about one’s past, as something that made one place different than another. I started to feel bad for the wee Mormon children. And then, naturally, I extrapolated a What If. 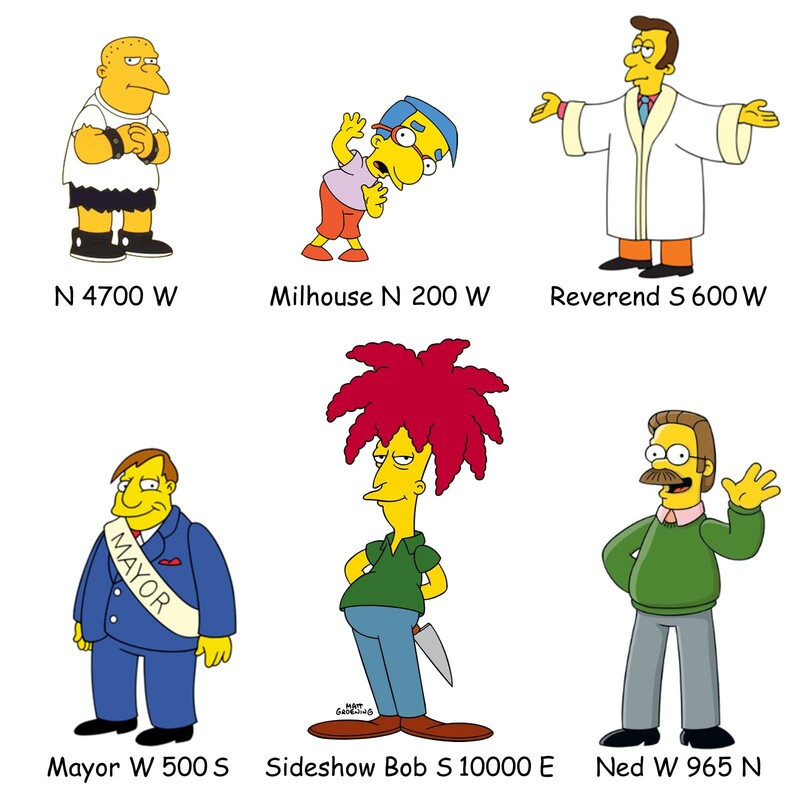 What if, instead of growing up on Portland’s NW Evergreen Terrace, Matt Groening had been raised in Logan, Utah? *with proper apologies to William F. Nolan (another great Northwesterner).